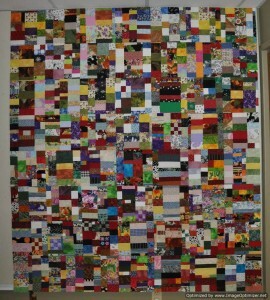 I have been watching other blogs and Pinterest as quilters followed Crazy Mom Quilts’ Scrap Vortex Quilt Along. Seeing the scrap quilts progress reminded me of my stack of crumb blocks that have been languishing on the shelf. I decided last weekend to start sewing them together and finished the flimsy this weekend. I did not put my squares together like was suggested in the quilt along. 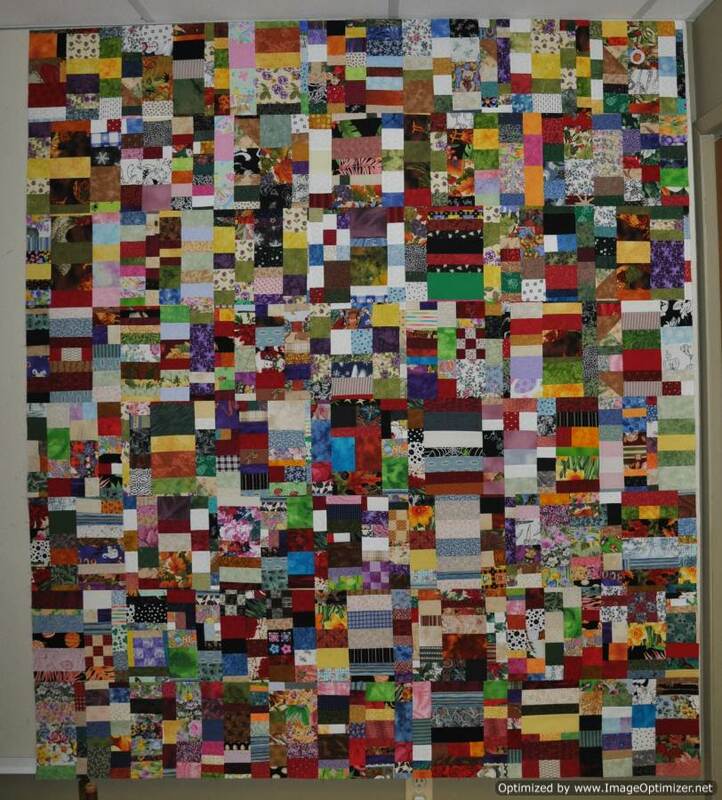 My blocks are pieced as strips of scraps similar in size like you would piece coin quilts. I then join the strips together and square them up into blocks. This quilt is a bit busy. I will go ahead and quilt it and then see if it needs something else added. I have a vision of adding some circular appliques randomly across the top. For now it is hanging in the closet waiting its turn on the long arm. This entry was posted in crumb quilt, scrap by Norma Hanson. Bookmark the permalink. Looks like a mosaic, or a Magic Eye Puzzle or something. I keep looking at it and expect to see something jump out at me.